Stainless steel is an incredibly resilient, useful material that can be used for a myriad of applications. At Stainless AD, we’ve made it our priority to create breathtaking fixtures that accentuate the usefulness of this material. Take our stainless steel toilets, for instance. We’ve usurped the use of more fragile materials like porcelain to build fixtures that are beautiful and hard-working. Aesthetically, stainless steel creates a more uniform environment. Due to its metallic look, these fixtures look much cleaner than their white porcelain counterparts. Porcelain can stain easily and it’s much more difficult to keep clean. Not only is porcelain more difficult to maintain, it is also very fragile and can be subject to vandalism. Stainless steel bypasses these issues without breaking a sweat. A stainless steel toilet will remain just that way, stainless. When it comes to outfitting a commercial restroom with toilets, they must be able to take on heavy traffic without showing wear and tear. Other options will simply falter while stainless steel toilets will exceed all expectations. Since stainless toilets feature a uniform design, they mount a strong defense against vandalism and destruction. Installing our stainless fixtures will not only increase the aesthetic value of your facility’s bathrooms, they will create a clean and environmentally sound environment. Are you looking for a truly original bathroom fixture? Perhaps you’re simply in need of a fixture that will be both reliable and pleasant to look at. No matter what you need, you can trust in stainless steel. Although toilets made from this material may not be too common in American households, you can bet they’ll add just the right amount of originality and usefulness to your home’s bathrooms. 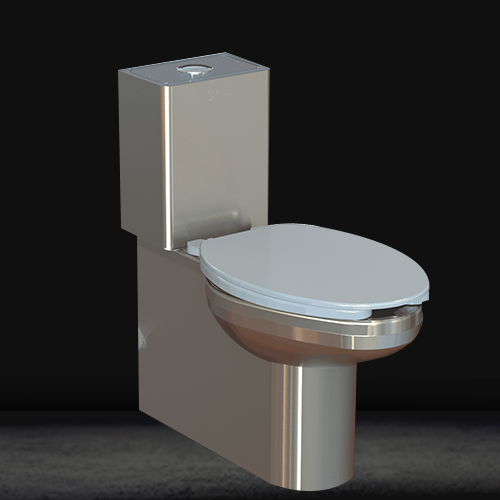 A stainless steel toilet will elevate the class of any bathroom. Its smooth design, clean lines, and metallic surface will create a more sophisticated environment. But this beauty goes much deeper. Stainless steel is one of the most resilient materials available on the market today. It can easily withstand daily usage and won’t allow any bacteria to grow and fester on its surface. Unlike porcelain toilets, which may yellow and be porous with age, the stainless steel will remain beautiful and will require minimal maintenance. Odds are you’ve driven past a disheveled porcelain toilet on the side of the road at least once in your life. This is an unpleasant sight that signifies a much deeper issue. Porcelain isn’t recyclable. Once they fulfill their main purpose, porcelain fixtures will get thrown out to live their final years in a landfill, adding to the ever-growing piles of trash. Stainless steel is completely different. Unlike porcelain, stainless steel is recyclable. This simple fact makes it a more environmentally friendly option. In fact, stainless steel fixtures tend to be made up of up to 60% recycled content. So, by outfitting your home with stainless steel fixtures and appliances, you’ll be doing your part in keeping the environment safe. This fact is beneficial for business and homeowners who are looking for the best restroom fixture options. Contact Stainless AD today to learn more about what we have to offer.